Coffee in a cone, anyone? What do you get when you combine coffee, ice cream, and chocolate? Dayne Levinrad of The Grind Coffee Company just created Coffee In A Cone, and the Internet is all for it! It’s essentially a cup of coffee in a waffle shell that’s been dipped in chocolate. Though he’s from Johannesburg, South Africa, Levinrad traveled all over the world for a little inspiration, and now we’ve been blessed with coffee in a cone! 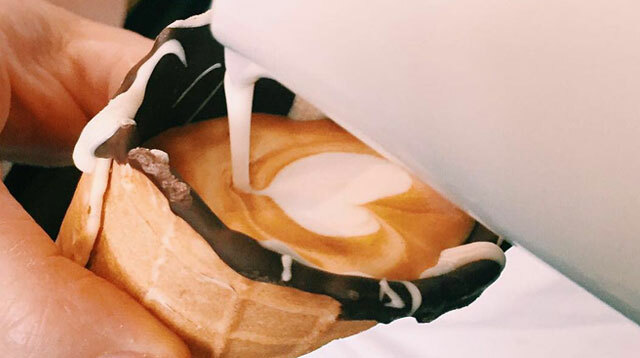 Because Levinrad knows that Instagram is the second best home of all things pretty—surpassed only by Pinterest—he created a hashtag that went viral: #coffeeinacone. Sweet and simple, right? But that’s pretty much the only simple thing about this new food trend. Levinrad reportedly had to combine four different types of chocolate before he got a hard enough blend that could hold coffee in the waffle. You only have 10 minutes to finish a coffee in a cone before everything falls apart!